Tomorrow the mystery "February MEGA-PROJECT" will be unveiled. It's a project, it's MEGA, and it will take all of February to do. That Yellowbelly is a harsh taskmaster. So mean! Ahem, not to be a whiner, and believe me when I say I can play the ADHD game with the best of them, but right now my OCD voices are raging in my head. They are worried that you have left Yellowbelly and Plum out in the snow, and they VERY concerned about the carnage THE SPACE WEED has wrought since the last sighting? Mega projects are all very well and good, but if the voices are not appeased, and soon, you will be getting the therapy bill. Awww, Yellowbelly is cute, even when he's looking so serious. It was fun seeing you yesterday! I'm loving the tongue sticking out. Reminds me of my son in his concentration mode. Mindy--when straining is on the line, Yellowbelly doesn't fool around. He takes competition seriously. DaNae--speaking of harsh taskmasters...I know, I know, there's unfinished business with the SPACE WEED (I really do know where it's going, I really do!) Yellowbelly and Plum in the Snow was just a snippet of a project I'm trying to convince my publisher to take, until they move ahead, I'm antsy to move ahead myself. And technically I didn't leave them out in the snow, I left them in house, post-bath, ready to get dressed. A good chapter break. 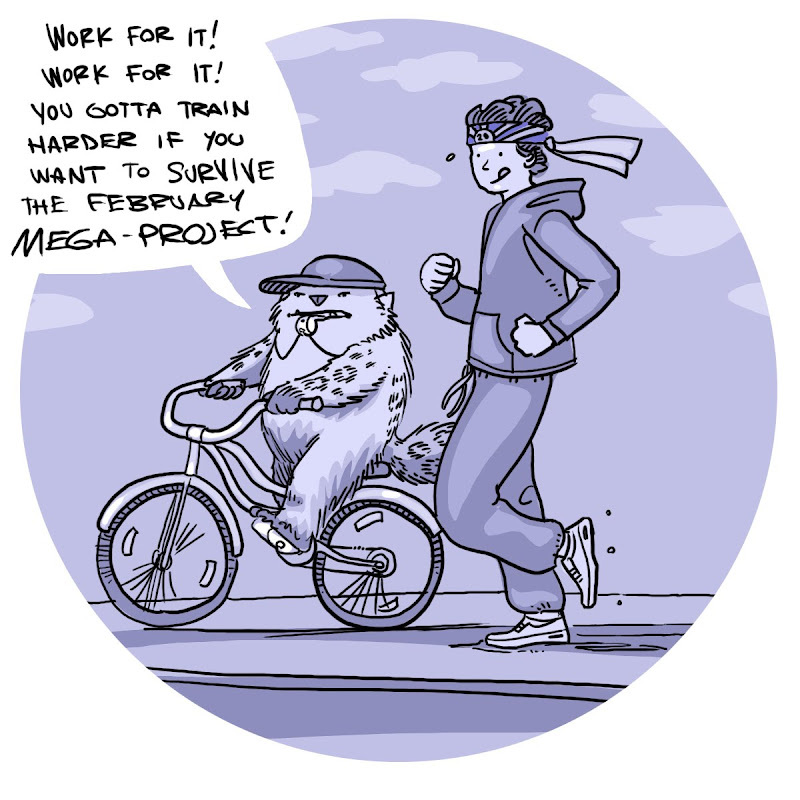 But trust me--you're gonna like the February Mega-Project, I GUARANTEE it. Nerd Goddess--I ran into on BYU campus, I was prepping for an illustrator panel in Rick Walton's Business of Publishing class. I spoke for an hour and told all kinds of neat publishing secrets. Fun to see you too! Rachel--Ah, good old tongue sticking out, the best way to show concentration in a cartoon. It never lets me down. That's supposed to read "when TRAINING is on the line..." I don't know what "STRAINING is on the line" means. Is that a little nod to Mike Tyson's Punch-Out? My son (and I, of course) love Yellowbelly and plum. I do this sweet puberty monster voice when I read it to him. Ha ha, yes, Mark, this is indeed a tribute to "Punch Out." As far as I'm concerned, the best workout montage from a decade filled with workout montages was from Punch Out, where the little guy ran behind the coach on the bike.